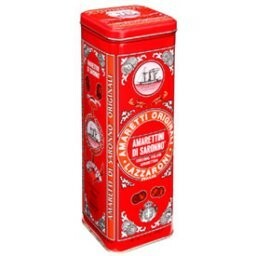 Petite-sized version of the Amaretti di Saronno cookies in a tall tin. 14.1 oz. The tall party tin contains 14.1 ounces of bite-sized little Amarettini di Saronno cookies. These tiny morsels come loose so that they are easy to sprinkle on ice cream and other deserts as a delicious topping. Make any occasion special with Amarettini di Saronno cookies.